BRUSSELS, Belgium -- There is nothing like political or diplomatic suspense. As the EU-Ukraine summit on 19 December approaches, nobody dares to blink. 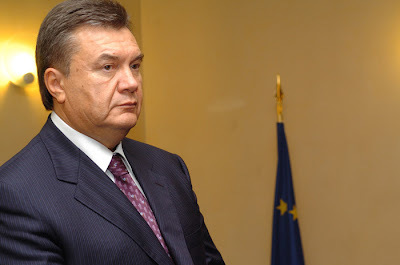 Viktor Yanukovych is not budging on Tymoshenko arrest. Brussels holds in its hands the future of an Association Agreement negotiated with Kiev over the past four years. The pact would extend the European free trade area to Ukraine, open up a large EU market to Ukrainian goods and businesses and help pave the way for a visa-free regime in the long-term. In short, it would put Ukraine firmly on the path of integration with Europe. She was sentenced to seven years in prison in October for allegedly exceeding her constitutional powers in signing a gas deal with Russia. Since then, she has faced additional charges of ordering a gangland hit, embezzlement and tax fraud. Even if she is let free - a dim prospect - her convictions would stop her from running in 2012 parliamentary elections. EU officials have said the Association Agreement will never enter into life unless Yanukovych lets her out. For his part, Yanukovych has said he might go to Moscow instead of meeting the EU presidents in Kiev on 19 December. After all, they snubbed him by cancelling a meeting in Brussels in October at short notice. For her part, Tymoshenko, when she met EU neighbourhood commissioner Stefan Fuele this week said the EU should sign the agreement no matter what. Killing the pact would harm millions of Ukrainians but would do little harm to Yanukovych's interests. For the past 20 years, Ukraine was relatively free. But the EU initiatives on offer - the European Neighbourhood Policy, the Eastern Partnership - were the same as those for authoritarian regimes in Azerbaijan and Belarus. For many years EU visa policy has also been making us feel like second-class Europeans - we have to complete a myriad of forms, pay steep fees, stand in lines and smile at the whims of consular bureaucrats. People do feel sorry for Tymoshenko at a human level. But they also remember all the scandals she was involved in and see the whole affair as a power-struggle between two clans not as a struggle between EU and Soviet-era values. According to one recent poll, by the Kiev International Institute of Sociology, her party has just 20 percent support while Yanukovych's party has 25 percent despite her miserable fate. The sad fact is that Yanukovych has more to gain by keeping her behind bars than by EU-Ukraine integration. He has not forgotten the humiliation he suffered when the Orange Revolution, with Tymoshenko in the vanguard, ended his first presidency before it began. He knows how good she is at whipping up protests. Yanukovych is busy making himself rich together with the friendly oligarchs who back his party. After one year in office he owns land in Kiev suburbs the size of Hyde Park in London where he is building the house of his dreams. He and his entourage's top priority is holding onto wealth and power not better relations with the West. Despite the bitterness of our unrequited love, 60 percent of Ukrainians - according to the Razumkov Center in Kiev - support EU integration. Following the fiasco of Yanukovych's cancelled EU meeting in October, almost 2,000 people from Kiev - mostly staff in civil society groups, activists and journalists - started a Facebook group called "We-Europeans." They also began to call weekly street gatherings to show support for closer EU-Ukraine ties. Even in Donetsk, the Yanukovych heartland, vulnerable people like like pensioners, Afghanistan war veterans and former Chernobyl clean-up workers are doing the same. Instead of threatening to freeze EU-Ukraine integration the EU should re-enagage with Ukraine as fully as possible. It should nurture this growing new activism and tap into the profound democratic energy in Ukrainian society. The agreement could, for example, include a suspension mechanism in case the Ukrainian government backtracks on democratic principles, giving Ukrainians a way to hold their government accountable for earlier commitments. The agreement can become for Ukrainians what similar agreements were for the people of Central Europe before the 2004 enlargement - a vital beacon for the direction that the country is heading in.